Pre-Photokina 2010: Canon has launched the PowerShot G12 premium compact, successor to PowerShot G11 released last year. Inheriting most of the core features of the G11, the latest model sees the addition of an EOS-style front control dial, Hybrid IS for close-up work, and 720p HD video recording. It also adds multi-aspect ratio shooting and SDXC card compatibility. The rest of the features remain the same including a 28-140mm equivalent lens, 2.8" tilt and swivel LCD, manual control and RAW shooting. 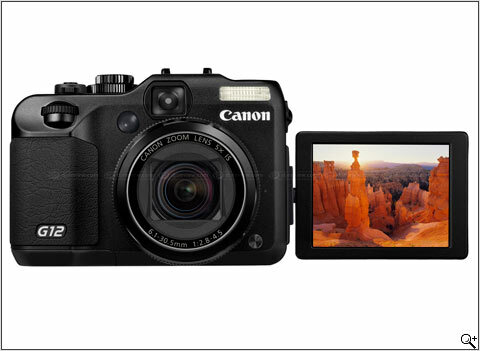 London, UK, 14th September 2010 – Canon today announces the new PowerShot G12 – the latest model in the multi award-winning PowerShot G-series trusted by professional photographers the world over. The new model offers photographers best-in-class flexibility and all-round powerful performance, with professional levels of control and support for a wide range of accessories. 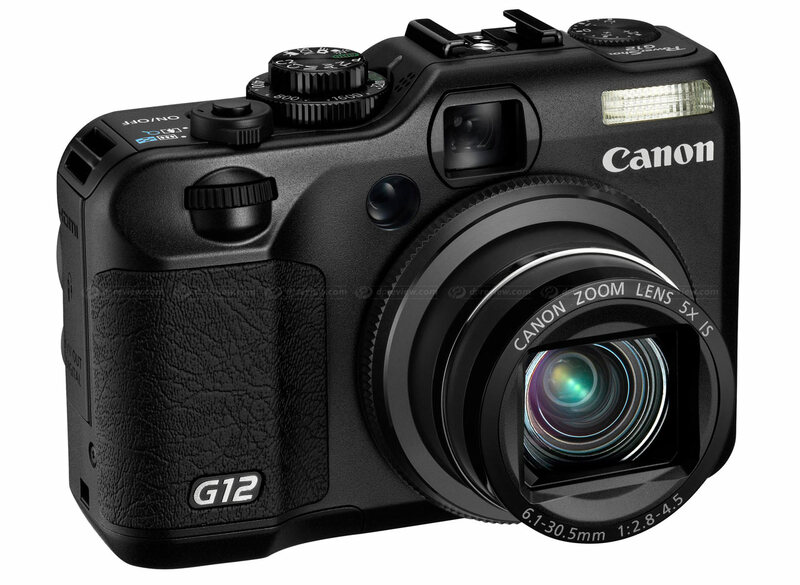 While retaining the classic handling and control of its predecessor, the PowerShot G12 has been designed to offer superior performance to suit the needs of professionals and enthusiasts alike. Canon’s HS System, 720p HD movie recording and Hybrid IS are new additions, delivering premium image quality in stills and movies, and a new Front Dial provides improved handling and swift manual control. The PowerShot G12 is also compatible with a new optional Lens Filter Adapter, which extends with the lens when using the zoom to offer full coverage throughout the zoom range. 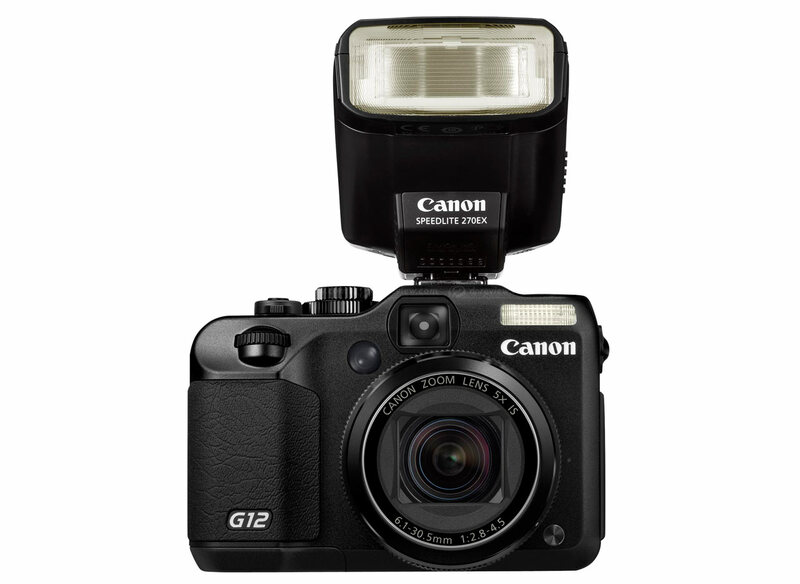 The PowerShot G12 is the first G-series model to feature Canon’s HS System – a powerful combination of a high-sensitivity 10.0 Megapixel CCD sensor and high-performance DIGIC 4 processor designed to provide outstanding image quality in all lighting conditions, including low light. The inclusion of the HS System allows shooting at higher ISOs with excellent image quality – enabling users to capture exceptional images in all conditions. This extended ISO range allows users to shoot darker scenes without engaging the flash or using a tripod – capturing correctly-exposed images using only the available light. In situations when use of the flash is necessary, a higher ISO will enable users to extend its effective range and illuminate the subject more effectively. Higher ISOs also enable users to utilise faster shutter speeds – freezing motion to capture moving subjects with a reduced risk of blur. Allowing users precise control over the ISO level, the dedicated ISO dial now allows adjustments in 1/3 stop increments. In addition to this, a new Auto ISO level adjustment feature allows users to pre-configure the maximum ISO setting they wish to use during shooting and specify how the camera selects the ISO to obtain the best balance between image quality and shutter speed. In very dark situations, Low Light mode can be used to extend the ISO range up to ISO 12800, with the ability for users to control ISO and white balance to accurately capture the ambience of a dimly-lit environment. Users can also capture fast-moving action with the ability to shoot at up to 4.2 shots per second. The PowerShot G12 features a premium 28mm wide-angle 5x optical zoom lens, allowing users to capture sweeping landscapes and get closer to distant subjects during shooting. Benefiting from Canon’s extensive heritage in lens design, the lens has been developed using the same processes and quality standards employed to manufacture Canon’s range of EF lenses, ensuring the capture of sharp, detailed shots while still having a compact size so the lens can retract completely into the camera body when not in use. Counteracting camera shake and enabling photographers to capture shots in darker conditions, the PowerShot G12’s optical Image Stabilizer allows shooting at shutter speeds approximately 4-stops slower than would be otherwise necessary to achieve a sharp shot. 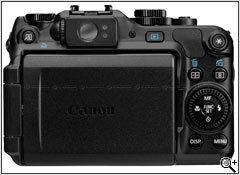 Also included in the PowerShot G12 is Canon’s Hybrid IS technology to increase the effectiveness of the optical Image Stabilizer when shooting macro subjects. The PowerShot G12 can focus as close as 1cm to a subject, and the slightest lateral movement of the photographer can negatively affect image quality, making it difficult to capture blur-free shots without the assistance of a tripod. Hybrid IS counteracts unintentional shift and angular movement – two kinds of camera shake that become particularly pronounced as image magnification increases. 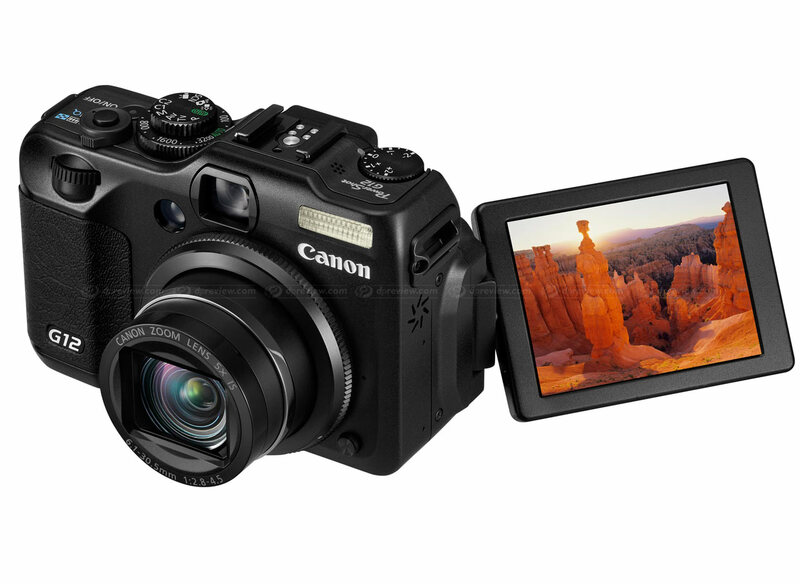 Flexible shooting and playback is provided by the PowerShot G12’s 7.0cm (2.8”) high-resolution Vari-Angle PureColor II VA LCD screen. The rotating Vari-Angle design offers easy framing from a range of angles, such as when shooting at ground level or overhead. 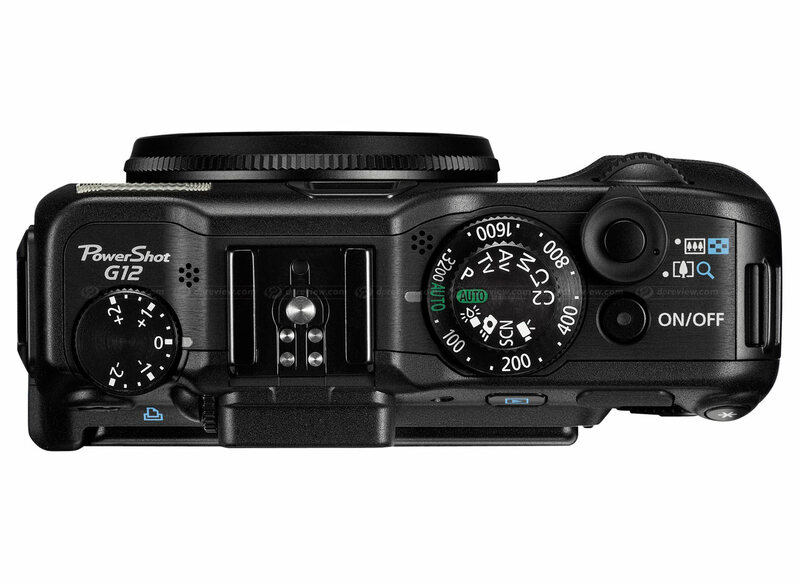 To accommodate a range of shooting styles, the PowerShot G12 also features an optical viewfinder (OVF) with diopter adjustment, allowing users to match the OVF to their vision. After image capture, photographers can also utilise the newly integrated RGB histogram during playback, allowing them to instantly check the exposure of a shot in detail. 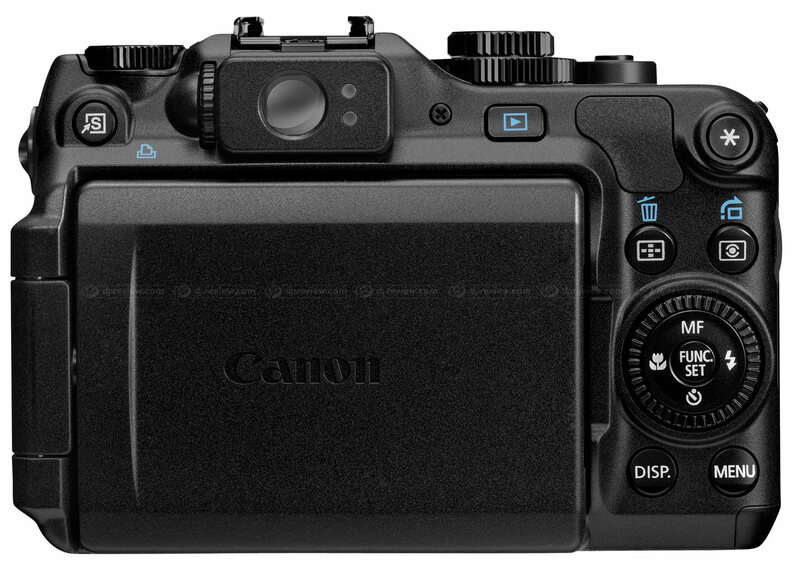 As well as offering Full Manual control and a range of semi-automatic modes, the addition of a new Front Dial provides swift and convenient access to settings during shooting. Users can either prioritise the Front Dial or the rear Multi-Control Dial as the main way of controlling the camera, or use a combination of both. For example, the Front Dial can be set to control aperture in AV mode while the Multi-Control Dial controls white balance or shooting aspect ratio, or it can be used independently, with the rear Multi-Control Dial disabled to prevent accidental changes to settings. For advanced amateurs and professionals, the PowerShot G12 also shoots uncompressed RAW images and includes Canon’s Digital Photo Professional (DPP) software, providing the ability to edit images after capture. Sharing the same post-editing environment as the EOS system, the PowerShot G12 fits seamlessly into a photographer’s existing workflow. 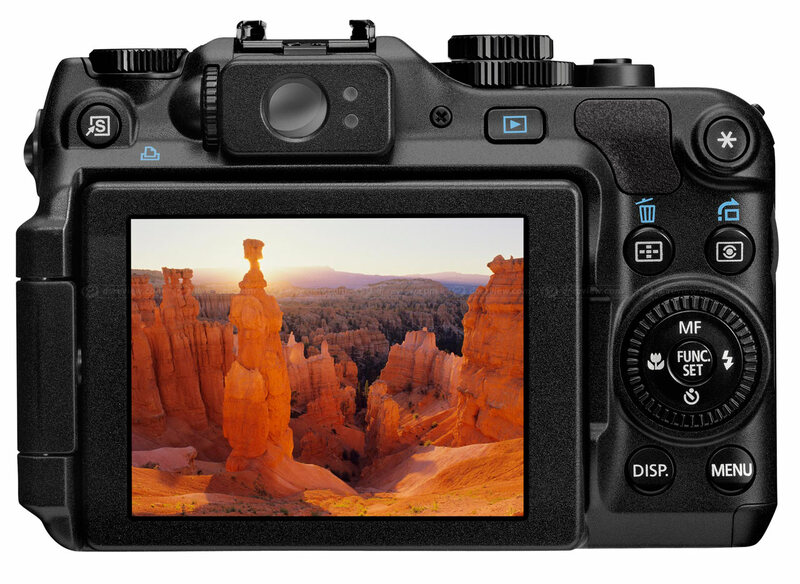 To aid the capture of level horizons, the PowerShot G12 also features a new Electronic Level function. Using information from the camera’s acceleration sensor, an on-screen indicator allows users to check if the camera is level, working in either horizontal or vertical orientations to ensure level shots of portrait or landscape scenes. Multi-Aspect shooting in 3:2, 4:3, 1:1, 16:9 and 4:5 formats also allows photographers to shoot according to their subject and the intended use of the image, enabling them to choose which composition and result they want to capture as the image is taken and removing the need to post-process. For the first time in a G-series model, the PowerShot G12 features 720p HD movie shooting (24fps) with stereo sound. Miniature Effect is also available in movie mode, adding a different dimension to video footage by shooting at a range of selectable slower frame rates for dramatic, compelling time-lapse-style videos which appear of model scale. An integrated HDMI port with CEC compatibility makes it simple for video and stills to be viewed on a HDTV and controlled directly using a compatible HDTV and remote control. Exceeding the limitations of conventional cameras the PowerShot G12 includes a new High Dynamic Range shooting mode*1, allowing the capture of high contrast scenes closer to how they appear to the user. While shooting on a tripod, the PowerShot G12 takes three different exposures of the same scene before analysing and combining shots in-camera to create a single image. The resulting shot captures highlight and shadow detail closer to how the photographer sees it. As part of i-Contrast processing, the PowerShot G12 allows control over the amount of Dynamic Range correction which is applied in the camera to suppress highlight blow out and shadow detail loss in the final result. To allow photographers to brighten only shadowed areas of an image, Shadow Correction is included to brighten darker areas and reveal hidden detail in shadow regions. To track subjects that are in motion, or to help achieve a creative composition, a new Tracking AF mode has been added to the PowerShot G12. This new mode gives photographers the ability to select objects from the centre of the frame and track them if they move, or if the frame is recomposed. The PowerShot G12 offers comprehensive support for a wide range of accessories, expanding both the creative possibilities and providing enhanced results in certain shooting situations. A new lens filter adapter FA-DC58B attaches directly to the lens barrel ring, providing the ability to attach 58mm diameter Canon filters – such as a Circular Polarizer, Neutral Density, Protect and UV. The FA-DC58B is designed to move along with the lens while zooming, preventing vignetting at the wide-angle end of the zoom and providing filter coverage throughout the full optical zoom range of the lens. The hot shoe provides compatibility with Canon’s range of EX Speedlites*2, enabling photographers to both increase the available flash power or use an external flash via a remote shoe cord (OC-E3) for creative off-camera lighting, or to experiment with different lighting techniques. An optional Waterproof Case provides protection at depths of up to 40 meters, allowing users to record deep-water experiences in stunning detail. While the PowerShot G12 offers the freedom and flexibility of manual control, users can also achieve exceptional image quality using Smart Auto mode. Intelligently detecting the scene and selecting the optimum settings from 28 variables, Smart Auto uses Scene Detection Technology to provide the best results in all conditions – allowing both serious photographers and beginners to capture excellent images instantly. Easy, wireless content transfers are supported by Eye-Fi connected functions, allowing remote uploads to image sharing websites such as CANON iMAGE GATEWAY. The camera features a dedicated Eye-Fi section within the User Interface, and disables the auto power-down function when the Eye-Fi card transmits data – allowing the easy transfer of content without interruption*3. Designed for photographers who demand exceptional quality in every area, the PowerShot G12 represents a unique blend of premium image quality, flexibility and excellent handling. A great complement to a larger SLR model or a powerful camera in its own right, it’s the perfect compact for professionals and advanced amateurs – delivering outstanding quality from a body small enough to take on every assignment. Owners of the PowerShot G12 can join the CANON iMAGE GATEWAY, an online facility for sharing photos and video. Photographers can take advantage of up to 2GB of personal storage capacity, creating enough room for hundreds of high-quality images. Mobile browsing is also supported, making it easy for friends and family to view photos on the move. *1 Tripod required for High Dynamic Range shooting. *2 See specification for details. *3 This product is not guaranteed to support Eye-Fi card functions (including wireless transfer). In case of an issue with an Eye-Fi card, please check with the card manufacturer.